Buried by all the 2008 releases, it's easy to forget classic hockey titles and recent gems. With that in mind I've decided to feature classic hockey books on the weekend. 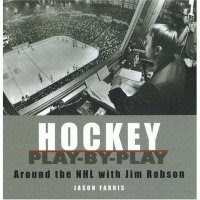 This weekend I wanted to start with Jason Farris' Hockey Play-By-Play: Around The NHL With Jim Robson. Robson played an important formative role in my youth, cementing me as a hockey fan because he was the best play-by-play man in the business. I wanted to pay homage to Robson, and to Farris' museum-like independently published book. Read the full review.